A nuclear meltdown occurred in Los Angeles in 1959 – the first commercial nuclear disaster in the U.S. For twenty years, the federal government covered it up, until local watchdogs discovered it. And nearly 40 years later, there has still been no clean-up. The Santa Susana Field Laboratory housed ten reactors in the hills above the San Fernando and Simi Valleys — three more of which also suffered accidents. There was also a plutonium fuel fabrication facility and a “hot lab” for cutting apart highly irradiated nuclear fuel, as well as thousands of rocket tests, all of which led to widespread radioactive and toxic chemical contamination. In 2010, the California Department of Toxic Substances Control (DTSC) committed to clean up all of the contamination at Santa Susana by 2017. But DTSC and the Responsible Parties – Boeing, the Department of Energy, and NASA – dragged their feet, and cleanup not only isn’t done, it hasn’t even begun. Now DTSC has issued a draft Environmental Impact Report (EIR) for the cleanup, which breaks every commitment made. The EIR proposes to let the Responsible Parties off the hook for cleaning up the great majority of their contamination. This would pose continuing risk to the hundreds of thousands of people who live nearby. 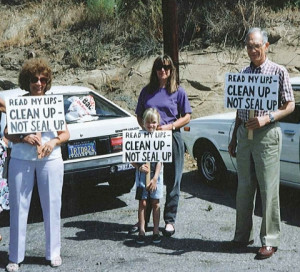 ACT NOW– Submit your comment to the DTSC opposing the breach of these cleanup commitments. Send your comment today, but no later than the deadline of December 7.